LEGOLAND Malaysia is the first LEGOLAND Park in Asia. It is the ultimate LEGO experience for fans of all ages, with a particular focus on families with children from the ages of 2 to 12. The family theme park has more than 40 interactive rides, shows and attractions. It offers a full day of adventure, education and fun. The 15,000 LEGO models found throughout the Park are created out of 50 million LEGO bricks. It contains the most popular rides and attractions from LEGOLAND Parks around the world, but everything is tailor-made for the local environment. The Park’s three restaurants, four food stands and 11 food carts cater to local tastes. LEGOLAND Malaysia has seven themed areas covering 76 acres - the same area as 50 full-size football pitches. The LEGOLAND experience starts at The Beginning, the entrance area to the Park and home to the largest LEGO shop in Asia, The Big Shop. It stocks 2,000 different LEGO and LEGOLAND products, and has more LEGO toy sets under one roof than anywhere else in the region. At The Brick Shop, LEGO fans can customise their own creations with hundreds of LEGO elements and accessories. Designed for LEGO fans of all ages, Imagination is where creativity knows no bounds. At the Build and Test Centre, LEGO inventors can bring their imaginations to life. The Kid’s Power Tower challenges everyone to prove their strength by hauling themselves upwards to gain a beautiful view over the Park, and young engine drivers can enjoy a gentle train journey on the life-size DUPLO Express. LEGO Technic is home to high speed rides for the brave and exciting LEGO workshops for aspiring designers. The highlight is taking a test drive on Project X, a wild roller coaster with a steep switchback track. Aquazone Wave Racers offers a thrilling wave surf where those watching can trigger water bursts to splash the riders. Children wanting to dry off can then head to LEGO Mindstorms, which encourages budding robot designers to build the future. At the centre of the Park, the miniature world of Miniland recreates famous Asian landmarks on a scale of 1:20 using more than 30 million LEGO bricks. It turns children into giants as they stroll through famous scenes from different countries, including the Petronas Twin Towers, the Merlion Statue and the Taj Mahal. Some of the LEGO models are animated, so visitors can bring LEGO figures, trains and airplanes to life at the touch of a button. Malaysia’s is the largest Miniland ever built for a new LEGOLAND Park. The project took more than three years to complete. Legends come to life in LEGO Kingdoms. From deep inside the royal castle, The Dragon roller coaster takes riders through the twists and turns of the Middle Ages on a fire-breathing dragon. The Dragon’s Apprentice offers younger guests the same excitement on a baby dragon’s back, while children are free to explore a multilevel treetop playground in The Forestman’s Hideout. Land of Adventure is a journey into the forgotten worlds of Pharaohs and dinosaurs. Dino Island is a daring boat trip to an ancient temple, where LEGO dinosaurs still roam and there’s only one way down. Everyone can join the laser-blasting hunt for hidden treasure in Lost Kingdom, while Beetle Bounce launches children up and down a 15 foot tower, nearly touching the gigantic LEGO beetles above with every bounce. Children really take control in LEGO City. The Driving School offers children a unique chance to drive on a true-to-life traffic circuit to qualify for their very own driver's license. Would-be captains can take the wheel of their very own battery powered boat at the Boating School, while families can race each other to put out the faux “fire” in Rescue Academy. LEGOLAND Malaysia is served by a number of direct services from bus terminals in the surrounding area. Buses operate every day from JB Sentral, Larkin, Gelang Patah and Johor Premium Outlets (JPO). A dedicated service leaves Larkin for LEGOLAND every thirty minutes during peak times. 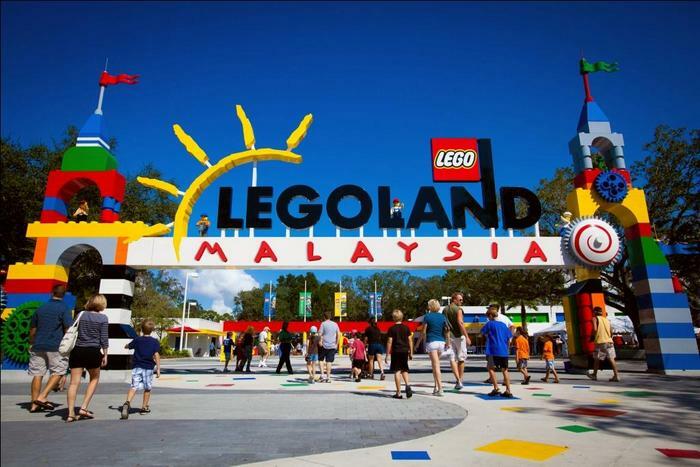 So next vacation when you visit Malaysia be prepared to dedicate an entire day to LEGOLAND Malaysia.